Placing a large order? Register a business account for additional volume discounts. 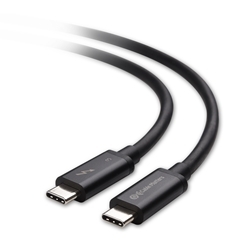 The Cable Matters Thunderbolt 3 cable connects to any Thunderbolt 3 or USB-C port on a computer, docking station, or display monitor. This Thunderbolt 3 cable carries twice the bandwidth of a USB-C cable and uses the same reversible connector. It is Thunderbolt, USB, and DisplayPort compatible. This Thunderbolt 3 cable uses the same slim, reversible USB-C connector that fit the thinnest laptops at 2x the length of of any certified USB-C cable. This Thunderbolt 3 cable is fully compatible with USB-C devices to deliver safe power delivery and data transfer at the same time. Average Customer Reviews: 0/5 Rated by 0 user(s) Click Here to write your review! For any questions, please contact Cable Matters Support.